It's always nice to be in the newspapers, well, so long as it's good news - and this is definitely good news. 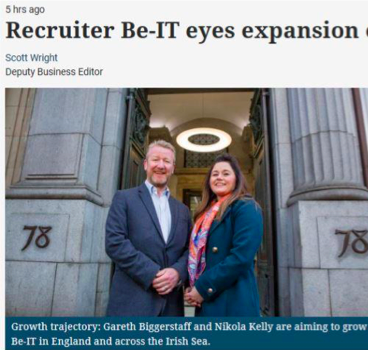 The Herald newspaper today carries a substantial article, both in the paper and online, on Be-IT's plans for further expansion in 2018 and beyond, as well as our move to much larger offices in Glasgow this year. You can read it in more detail here. Be-IT eyes expansion outwith Scotland. Demand for digital change in society is at an all-time, which has given us the confidence to make these investments, both in the new Glasgow office and in a move into north-west England. Watch, as they say, this space!